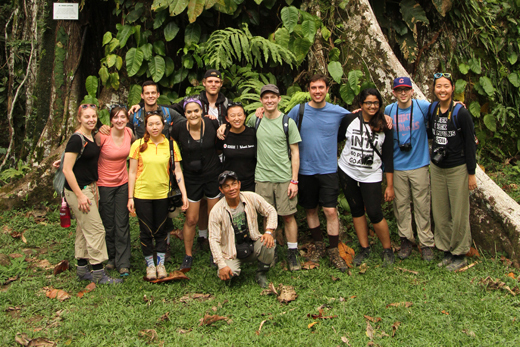 Students taking "Ecology of the Tropics" have the opportunity to travel to the Amazon rain forest in Peru over spring break, where they experience lectures given on hikes, boat rides and in local villages. Students from the 2015 trip are pictured here. Photo courtesy of Lawrence Wilson. As the spring semester begins, Emory students delve into a wide range of courses bringing innovative, interdisciplinary perspectives to important issues. Students will utilize the resources of Emory's Stuart A. Rose Manuscript, Archives and Rare Book Library to explore "Resisting Racism: From Black is Beautiful to Black Lives Matter," creating exhibits to showcase their work. In the wake of events such as the terrorist attacks in Paris and San Bernardino, others will examine the role of highly skilled health care leaders in emergency preparedness and response. Emory College students will travel to the Amazon rain forest of Peru to study the ecology of the tropics, and students at Oxford College will spend two weeks in Spain to study sustainability and cooperative economics. Students will also examine and employ digital technology in creative ways — studying writing through videogames and podcasts, using digital mapping as a tool for art history, analyzing the impact of Fitbits and similar fitness trackers on health, and bringing "big data" processing to the study of linguistics. They will also choose from courses that intentionally move beyond the typical boundaries of academic schools and departments, from a University Course on "emotional evidence" to a Coalition of the Liberal Arts (CoLA) Course focused on "disability, resilience and the mortal self." Here is a sample of this semester's coolest courses from across the University. Cool factor: As the information age has revolutionized the way humans live, individuals are experiencing information overload where the amount of data encountered grows beyond the human capacity. Although multimedia became a substantial part of big data, text is still the most primitive yet dominating medium. This interdisciplinary course teaches how to extract necessary information from text (linguistics), make statistical analysis of the extracted information (quantitative theory and methods), and write computer programs to automate this process (computer science). Course description: This course focuses on the analysis of plain text, syntactic and semantic structures, ontologies and taxonomies, discourse and distributional semantics, as well as their applications in computational linguistics. Homework assignments may involve big data processing using cloud computing. Cool factor: Undergraduate students from the Oxford and Atlanta campuses will develop collaborative digital scholarship projects to submit to the peer-reviewed online Journal of Humanities in Rehabilitation. The scholarly journal will publish the series of projects from this course, presenting an expected rich cross-disciplinary range of insights about disability, ability, care and shared life histories. Course description: Undergraduate, graduate and faculty participants will challenge the common understanding of disability. The class will examine the way individuals develop, experience, deal with, and construct narratives about normality and mortality through the lens of disability, across the arc of their lives. By collaboratively studying scientific, clinical and humanistic perspectives, the class will get beneath treatments and policies to explore narratives to share a better understanding of disability and care. Weekly class sessions will often include guest faculty facilitators from throughout the University. Departments: The course is listed at Emory College as IDS 385W and at Oxford College as Anthropology 385RQ. The course — and especially the connection between the Oxford and Atlanta campuses — is made possible by the CoLA program. Cool factor: This course has an accompanying field course (Biol/EnvS 372) that is taught in the Amazon rain forest of Peru, "home to the greatest expression of life of the planet," according to Wilson. Over spring break, students immerse themselves in the tropical rain forest — meeting local people, shamans, monkeys, sloths and more. Lectures are given on night hikes, boat rides and at local villages. Course description: The course explores the diverse biomes of the tropics with a focus on tropical forests, mangroves, coral reefs and grasslands, and an emphasis on ecological processes, biodiversity, and human impact in the tropics, indigenous peoples, and ethnobotany. Cool factor: The course offers an interdisciplinary perspective on the ways researchers in different fields treat emotions in their efforts to construct knowledge. In fields such as medicine, law, ethics and the life sciences, it explores whether emotions are welcomed as providers of information, tolerated with skepticism, discouraged as disruptive, or banned outright. Weekly guest speakers from programs across Emory will present their research or creative work. Course description: Until recently, many fields of knowledge have urged researchers to think as rationally as possible and to suppress emotional urges so that they can create sound, reliable knowledge. In the past two decades, however, evidence has been accumulating that emotions play a role in any investigative study. This course will compare the attitudes that diverse disciplines including medicine, nursing, public health, psychology, law and the humanities are taking toward emotions. The course will bring together researchers in these fields whose studies and work experience address these questions. Department: This is a University Course. Cool factor: This class will feature a two-week field trip to Spain to study comparative possibilities for sustainability. In mid-May, the class will begin in Madrid, visiting urban farms and gardens, professors and journalists who study corruption, and members of the emerging political coalition, Podemos. They will also travel to the world-famous Mondragon cooperatives to take a day school on cooperative economics and on to Andalusia to talk with cooperative farmers in a small town attempting to resist austerity. Course description: Global Political Economy and Sustainability is designed to teach students the basics of political economic analyses and apply those to the three spheres of sustainability — economy, society and environment, and their many overlaps. Students will be asked to think critically about how the economy cannot be separated from larger operations of politics or how society organizes power, with a specific emphasis on how historical, geographical and cultural context can both create and limit possibilities for sustainable social organization. Cool factor: Students gain hands-on experience with a wide variety of self-tracking devices throughout the semester while we examine the science supporting each measure in class. The devices include physical activity monitors, heart rate monitors, biofeedback devices, and bioimpedance scales. The purchase of these devices was made possible by a grant from the Center for Faculty Development and Excellence and students are loaned the equipment throughout the semester. Course description: Technology is allowing people to easily monitor a wide range of variables that can help monitor individual health status. While monitoring some variables, such as weight, isn't new, recent advances in technology have made it possible for individuals to sequence their own microbiome or to monitor their activity level 24 hours a day. The class will examine a variety of available measures and how each may help inform individual health decisions. The class will examine the scientific findings that support the application, reliability and validity of each measure along with the potential misinterpretation or negative consequences of this data explosion. Cool factor: Learners will perform daily operational briefing as carried out in intelligence data and processing, plan and implement components of various strategies and tactics in simulated high impact events, participate as leaders in table top disaster scenarios and visit an Emergency Operations Center. Course description: Recent events such as the terrorist attacks in Paris and San Bernardino, winter storms, flooding, biological outbreaks continue to remind us of the need now and in the future to have highly skilled health care leaders in emergency preparedness and response ready to support our local, regional, state, national and international communities. This course prepares leaders to engage the mission. Departments: Nell Hodgson Woodruff School of Nursing; open to other interested graduate students, including those in the School of Public Health and the School of Medicine. Cool factor: Digital mapping promises to transform art history and the humanities at large by offering scholars fresh tools to develop research questions, analyze data and publish findings. Art historians at the forefront of this innovative approach to the study of art and history employ maps to provide refreshed looks at photography, soundscapes, cities and developments in the art market. Course description: Students will consider maps as visual images, research tools and scholarly products. The class will meet with scholars engaged in digital mapping projects to discuss why they decided to embrace the approach for their work, what they hope it will yield them, and challenges they have faced in developing their projects. Students will work on a collaborative project to map images of masquerade performances in 20th-century Nigeria and develop a mock funding application narrative for a map-related research project. Cool factor: Students will use integrated marketing communications and research-based consulting to develop a strategic campaign for real clients, The Coca-Cola Company and Church's Chicken. The result is the equivalent of a mini-internship for students, who will have the opportunity to have implemented their solutions to the clients' challenge. In the past, Coca-Cola and/or its client-partners have made offers of summer internships to students in the class. Course description: The class teaches problem-solving, marketing issues, client issues and working within team situations. Students will collect data and analyze it in light of the clients' needs. Students will be exposed to a combination of client meetings, lectures, class discussions, guest speakers, and project working sessions with an emphasis on participation and interaction. The teaching assistants were leaders in the class the year before and will help guide students through a rigorous process of consulting in marketing. Department: Goizueta Business School; students in other schools and discipline can enroll in this class with permission. Cool factor: Students will produce a weekly podcast with episodes focused on analyzing the kinds of things we do with the videogames we play. They will contribute descriptions of artifacts to the Unpacking Manuel's project, using them to craft a game in Twine. We will play and discuss a number of games and read John Darnielle's novel about alienation and despair and the search for meaning, which [the protagonist] finds in a postapocalyptic role-playing game he invents. Course description: As products of a complicated network of social, economic and technological forces, videogames are deeply layered with multiple meanings and hidden histories that reveal much about cultural values, hopes and anxieties, and assumptions about the world. Students will study the cultural and narrative significance of videogames (and some other types of games) to understand both their narrative and formal aspects, while at the same time mapping connections between videogames and their broader social contexts — how games are designed and manufactured, who plays them and where, and in what ways videogames can be more than entertainment. See the course website. Cool factor: The goal of the course is to do archival research on the civil rights movement in the Stuart A. Rose Manuscript, Archives, and Rare Book Library and develop a physical exhibit with the discoveries will be displayed in the teaching theater in the Rose Library. A digital exhibit on Omeka is planned pending copyright acquisition. The goal of the exhibit is to juxtapose the civil rights movement's strategies and tactics with what is happening presently in the Black Lives Matter Movement. Course description: The class will develop a narrative of anti-black violence in America and the anti-racist resistance to that violence. Using the primary sources found in the Rose Library, class members will investigate how racism in America has (and has not) changed over the last 60 years by contextualizing and juxtaposing the Black Lives Matter movement with the American civil rights movement of the 1960s. Students will develop a digital exhibit on Omeka and a physical exhibit in the Rose Library's Teaching Theater using artifacts found in the library.